"I have been calling for a national strategy for some time now because we have witnessed for too long Health Boards taking decisions in isolation from the regional or national picture, or indeed public opinion. "Finally we now hear that there will be an expert group to develop a national framework for service change. However, this is rather too little too late. "I would have thought that this national strategy should have been in place first, before Health Boards throughout Scotland embarked on centralising services. "While this is better late than never, what we must now have is a delay in decisions, or imminent major service reviews by Health Boards, to allow a national framework to be developed. Otherwise these decisions may run counter to the 'strategic national focus' recommended by the expert group over the coming months." "The judgement that slopping out amounted to degrading treatment and breached human rights legislation should come as no surprise to anyone. It was in some ways inevitable. "The Scottish Executive can't say it wasn't warned. As recently as last year, the Prisons Inspector Andrew MacLellan, said it had to end. But he wasn't the first - his predecessor had been saying it for years. "This case was only ever going to go one way and now the Executive face hundreds of claims for compensation from other prisoners. Because of a failure to invest in prison conditions, they now face having to make compensation payments to convicted prisoners. If similar payments were made to Peterhead prisoners that would amount to £¾million. That is quite extraordinary and I believe no taxpayer will find palatable. "Locally, prison officers came up with their own solution to end slopping out at Peterhead Prison which could have been implemented some time ago. It is quite telling that prison chief Tony Cameron and the Scottish Prison Service have chosen to drag their heels on this matter, preferring it would seem to continue in their desire to do down Peterhead and the work carried out there. Banff & Buchan MSP Stewart Stevenson will be visiting New Byth Primary School tomorrow (Friday) at 9.00am as part of MPs’ Back to School Day, organised by the Global Campaign for Education, a worldwide coalition working to end the injustice where approximately 100 million children throughout the world get no school education. The Global Campaign for Education includes the Scottish Education Trade Unions and charities including Oxfam in Scotland and Save the Children, as well as many other trade unions and organisations from around the world. “It is important for our young people to realise the importance of education and the implication of a life without the chance to learn. MPs’ Back to School Day is connecting them with local democracy and with children worldwide to make a difference. Banff and Buchan MSP Stewart Stevenson has supported the Equal Opportunities Commission campaign for pay equality for women. Research carried out by the Equal Opportunities Commission (EOC) has shown that women working full-time earn, on average, less than £559 per month than men. They have launched a campaign to raise awareness of the issue. "Even if the level of skill, effort and responsibility is the same, women can still get paid less for their work than men. Indeed women tend to be offered lower starting pay and often miss out on benefits, bonuses and pensions too. "Years of second class treatment often mean women's pensions can reflect years of discrimination also. This sexism must end. "To think that women are still being disadvantaged in this day and age is disgraceful. The reality has been swept under the carpet and many women are not aware they are actually being discriminated against, as the subject is taboo. "If there is any doubt over pay and entitlement issues discreet enquiries can be made to the Equal Opportunities Commission." Banff and Buchan MSP Stewart Stevenson has signed his SNP colleague, Tricia Marwick’s Parliamentary Motion highlighting MS Awareness Week. “Multiple Sclerosis (MS) is an incurable neurological condition, which usually strikes at the prime of life and it is estimated that 2,500,000 people in the world have MS - and, of those, over 10,000 are in Scotland. Around 50 people, usually between 20 and 40 years of age, are diagnosed every week. “Medical research has uncovered many probable factors in MS, such as the environment, a genetic link, and a trigger virus. However the cause has yet to be conclusively identified. Symptoms can range from mild and occasional illness to severe and rapid deterioration. Fortunately for most people with MS, the pain lies somewhere in between the two extremes. The most common symptoms include extreme weakness, slow speech, blurred vision, nerve pain in the face, ringing in the ears or hearing problems, pins and needles or numbness in the legs, feet, arms or hands, muscle pain, loss of memory and difficulty in concentrating. “The good news is that MS is manageable. Symptoms differ in severity from individual to individual. There are drugs that lessen and control specific symptoms plus physical therapies and practical or psychological techniques. Some people experience what's called remissions and relapses. These are periods when their symptoms disappear or get worse. For others, their symptoms are there all the time. Mobility equipment, such as a wheelchair or a specially adapted car, can give back some sense of independence to those with more severe MS.
Banff & Buchan MP Alex Salmond and MSP Stewart Stevenson have met with local sub-postmasters as part of their continuing campaign to secure the future of the local Post Office network. The meeting, which was held in Lonmay, saw sub-postmasters brief the Parliamentarians on the obstacles and tactics deployed by the Department for Work & Pensions to coerce people away from the Post Office and agree to have their pension paid direct to their bank accounts. “It was quite disgraceful some of the stories which were relayed to me by postmasters at the meeting of the various methods deployed to channel people away from continuing to receive their pension or benefits at their local Post Office. Banff & Buchan SNP Parliamentarians Alex Salmond MP and Stewart Stevenson MSP are to meet with local sub-postmasters tomorrow evening (Tuesday) in Lonmay. The meeting is the latest in a series of initiatives and activities undertaken by the SNP duo in their campaign to secure the future of the Post Office network in Banff & Buchan. “The Post Office is being discriminated against by the Government’s programme to pay benefits into bank accounts rather than continuing to support their local Post Office. This is all the more perverse as most bank branches outside of the main towns have either closed or operate reduced hours. “A far more sensible option would be for the full range of banking facilities to be available through the Post Office network, thereby securing the future of Post Offices and also allowing customers to access their bank accounts without a journey to the nearest large town. Oxfam in Scotland has welcomed the decision of Banff and Buchan MSP Stewart Stevenson, to join their Control Arms campaign. The global campaign, organised by Oxfam and Amnesty International, calls for tighter controls on the arms trade through an International Arms Trade Treaty. Mr Stevenson has shown his support for the campaign by getting his photo taken for the global ‘million faces’ photo petition and has encouraged local people to follow his example. “I am happy to support this campaign. I receive numerous representations from my constituents and SNP supporters on this and similar issues. I know that my Westminster colleagues have also supported a Parliamentary motion calling for a legally-binding International Arms Treaty. 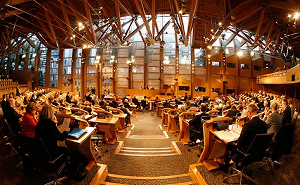 “Oxfam welcomes Stewart Stevenson MSP’s support for an Arms Trade Treaty. The arms trade is out of control. One person is killed every minute by arms. It is a global problem with horrific local consequences – and it is poor people who suffer the most.